This Fillow Street home has it all as far as the new Norwalk blight ordinance is concerned: a rotting roof, a possibly abandoned vehicle and a lack of maintenance. NORWALK, Conn. – After nearly two years of work, this Common Council on Tuesday night accomplished something prior councils could not – pass a blight ordinance. Everyone involved agreed that it left a lot to be desired. Two people criticized the ordinance during the public speaking session. 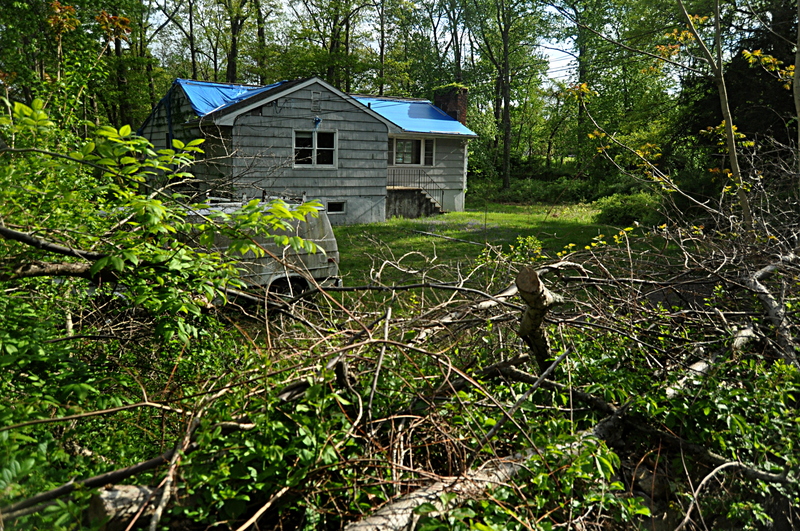 Scott Kimmich said that commercial properties in the area of Scribner Avenue and Connecticut Avenue need attention, as one is “pretty unkempt” and another “really disgraceful for our city,” as it’s the first thing people see as they get off I-95 at exit 14. An op-ed she wrote in 2007 regarding an ethics ordinance could be used again with the blight ordinance, just by swapping out a few words, she said. Council members said in 2007 that they had worked hard on an ordinance, therefore a reason to pass it, she said. The ordinance could be improved on, they said, according to Cece. “I think this is indicative of a syndrome here, the something is the good enough syndrome,” she said. The blight ordinance, and its cousin, an ordinance requiring landlords to register with the city, passed easily. The ordinances becomes effective on Jan. 1. Blight is defined as a condition that poses a serious or immediate danger, a lack of adequate maintenance and property that has been cited for two or more code violations, which have not been corrected and are not in the process of appeal. The ordinance specifically mentions missing or boarded windows, rotting or missing portions of walls, roof or floors; missing siding; fire damage; garbage piling up and abandoned cars. Written warnings that are not heeded within the time period specified will be followed by a citation, which carries a $100 a day fine. Unpaid fines will constitute a lien on the property. The city can also cure the blight itself if nothing is done within 30 days. Those costs will also constitute a lien. The landlord ordinance fine of $250 or the first violation and a fine of $1,000 for any subsequent violation. Councilman Doug Hempstead (R-at large) said the landlord ordinance isn’t perfect. Councilman Bruce Kimmel said the Stamford ordinance is very complex, and would be very expensive and implement properly. Committee members studied about a dozen ordinances from other cities and towns, he said. Councilman Matt Miklave (D-District A) said it was a good start, but expressed skepticism. The Democratic caucus proposed two last minute amendments. The Democratic caucus asked for two changes to the blight ordinance, after conferring with Assistant Corporation Counsel Brian McCann during a recess. Minority Leader David Watts requested that words be added to specify that violators be given information and possible assistance. “We want to send a message that we are not out there to punish people we are there to help people,” he said. He also questioned the language regarding a hearing officer. While the mayor would appoint such an officer in the original wording of the ordinance, Watts requested that such an appointment would be approved by the council, and perhaps be a lawyer. Mayor Richard Moccia responded in a testy way. “It would be helpful if this had been presented at the ordinance committee prior to tonight,” he said. McCann said the language would not only be benevolent but would also serve a purpose, as city attorneys could say in court that a violator had been given every opportunity. Watts dropped the desire for council approval, but McCann added that a hearing officer would be a standing member of the Connecticut Bar Association. The amendment passed. Councilwoman Anna Duleep (D-at large) recused herself from the vote on the advice of Corporation Counsel Robert Maslan, as a property owned by her mother could be considered blighted. Everyone present voted for the blight ordinance. Council members Michelle Maggio (R-District C) and McCarthy (R-District E) were absent. Common Councilman Fred Bondi (R-At large) abstained on the landlord registration vote. Later, he urged the council to work on an ordinance for commercial properties. Small minded politics again, generate revenue and increase property values “ever so slightly” thru blight ordinance, I have a question, when will the city “clean up” Meadow Street? there are a lot of nice families that live there, who plant their gardens, paint their houses, mow their lawns, and get to sit on their porches on a sultry summer eve to watch the crows pick over the crushed cars at LaJoie’s and LeBlancs, Oh, what that you say? they’ve been there forever? and why the fuss? Clearly, Norwalk has become a small minded town, and if anyone thinks their property value will skyrocket because some is being fined 100 per day for their faulty roof? guess again. You want the glory days of Norwalk? you’d better push aside the juvenile plans for Big Box, and find a way to attract starts up in high tech back to this area. And have patience, for it will take those starts up quite a few years to bring back the high paying jobs that Perkin-Elmer, Nordens and other employers offered. But in the meantime, have fun with your compliance officer, I am sure it will be a badge of distinction to fine retirees in this town for their unmowed lawns. Ahhh Norwalk Lifer: Well said. The point is there are property owners, especially absentee landlords, who can afford to fix blight conditions but don’t want to. If you read the article or the ordinance, you can see it is not about requiring people to have their house ready for the photographer from House and Garden or CT Magazine. I did read the article, and it’s small minded nonsense!, vote for the Big Box, don’t encourage start ups to move their businesses to Norwalk, and if YOU read the article you’ll see the Duleep recused herself because “her mother’s home could be considered in violation of the blight ordinance”, now let’s start attacking the retirees in this city, and let’s also close our eyes to the blight on Meadow Street, it’s okay as long as it’s not in our neighborhood right? This is nothing more than an indication of “I ran out of good ideas” syndrome in Norwalk!. Time for “new minds, and not that little kid Vinnie M, he’s showing his true colors.